Make sure the chromium supplement you take passed our test and is right for you! Chromium is an essential mineral, important for insulin function. Chromium supplementation is promoted to help with blood sugar control in people with type 2 diabetes and with weight loss. But does it really work, and if so, which products are best? ConsumerLab.com recently tested popular chromium supplements and reviewed the clinical evidence. After purchasing chromium products at retail, each was tested for its amount of chromium and potential contamination with a potentially toxic form of chromium known as hexavalent chromium or chromium VI. 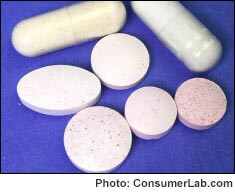 All tablets and caplets were tested to be sure they would break down properly in disintegration tests. Among the products that passed our tests, we selected our Top Picks, representing the best quality and value. These Top Picks include those providing 200 mcg, 500 mcg, and 1,000 mcg per unit, because there is a wide variation in strength among products. This means that if you rely on supplement labels, you could be getting too much chromium, or not enough, depending on your needs and your reason for taking it.